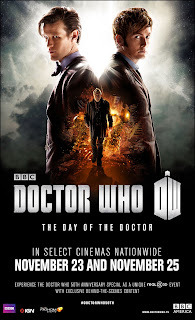 BBC AMERICA announced today two special theatrical screening events of Doctor Who’s 50th Anniversary special, Doctor Who: The Day of the Doctor, in RealD™ 3D on November 23 and 25, 2013. In addition to Matt Smith, the 50th Anniversary special also stars former Time Lord David Tennant and Jenna Coleman with Billie Piper and John Hurt. 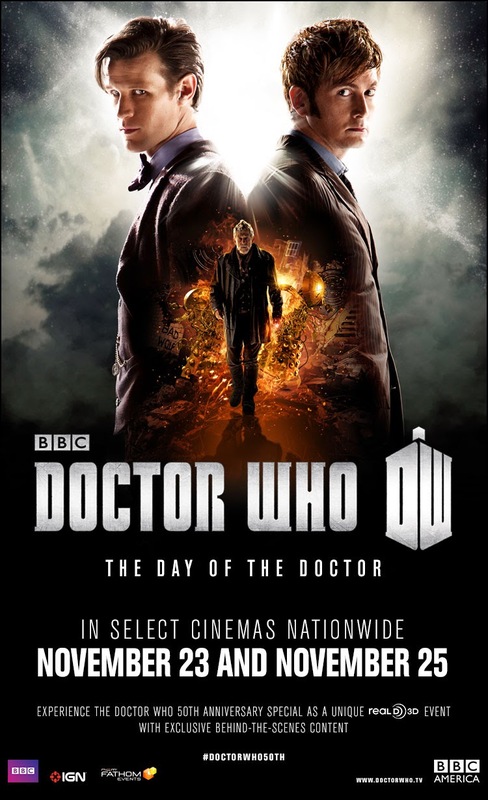 The theatrical events will include specially shot introductions and The Day of The Doctor: Behind The Lens, a 10 minute behind-the-scene featurette directly following the special. The short features Matt Smith, David Tennant and Jenna Coleman with Billie Piper and John Hurt, as well as lead writer and executive producer Steven Moffat, discussing their 50th Anniversary experiences. The U.S. in-theater exclusive, a behind-the-scenes short of over 10 minutes, will also be available in the UK on www.bbc.co.uk/Doctorwho at the same time.